This project examines the establishment and impact of the religious orders after the Christian reconquest of NE Spain in the early 12th century. It adopts an archaeological perspective to place monastic achievements into a wider landscape context. Through our excavations, documentary analysis, standing building survey and topographical recording of monasteries, residences, granaries and watermills we are investigating themes such as settlement form in a multi-faith society and the transformation of irrigation systems, crops, woodlands and fields on the frontier. The first part of this project was a study of the archaeology of the Military Orders, in particular the Templars and the Hospitallers. Many books have been written about their history and unusual blend of monastic ideals and soldiering. Nowhere was this more the case than in Aragon and Catalonia where the local aristocracy were well disposed in the Templar’s favour following the capture of Zaragoza in 1118. Especially after September 1134 and the death of King Alfonso I of Aragon, ‘el Batallador’, there was a fear that recently conquered ground might immediately be lost, either to the Almoravides or to Alfonso VII of Leon and Castile, so strategic donations helped the Orders to accumulate properties and privileges. In this project we have studied and published the archaeology, architecture and history of the Templar, and later Hospitaller, preceptory at Ambel. We also consider the interpretation of graffiti and material culture, as well as documenting the environmental impacts of Holy War, making comparisons with the Baltic and the Holy Land. The second part of this project is a study of the archaeology of the major Cistercian monastery at Veruela, Zaragoza. This entails an improved understanding of the acquisition and exploitation of Veruela’s monastic estate, including its management of farming, woodland, irrigation systems, rural settlements, granges and domestic buildings. As is often typical of the wealthiest monasteries, abbots from Veruela also selected houses on their estates and developed them with additional chambers, stables and chapels; one such can be found nearby at Bulbuente. The complex here comprises a re-used and enlarged Roman stone tower with an adjoining rammed earth and brick-built palace of the 14th-16th centuries. 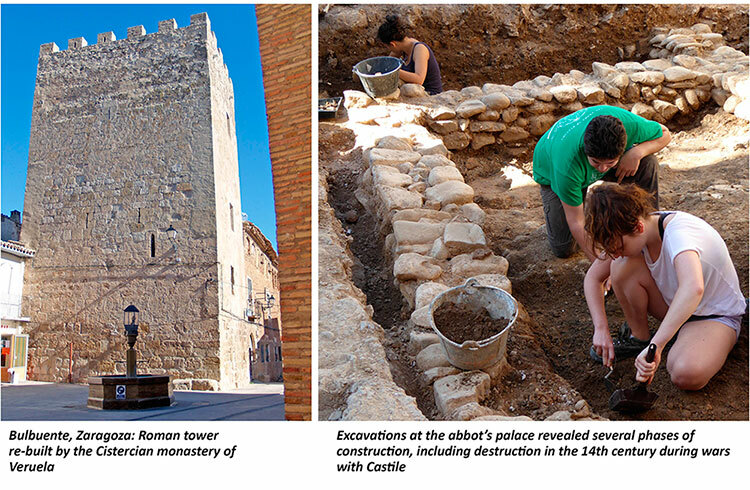 Excavations at Bulbuente in the summer of 2013 and 2014, together with the recording of the standing buildings and tracing of graffiti, reveal a more involved history, including the destruction of the complex during the war of the two Peters between Castile and Aragon (1356-1375), and kilns for the production of glazed wall/floor tiles used at Veruela in the 16th century. Relatively few monastic manor houses like Bulbuente have been excavated across Europe but they were important judicial and administrative centres and served not only as stopping off points during tours of inspection for the abbot and his retinue but also as an occasional escape from the confines of the monastic precinct. Excavations at the Islamic settlement of La Mora Encantada, just outside the present day village of Bulbuente, have provided vital clues to understand the settlement pattern in the area prior to the Christian reconquest in the early 12th century. Domestic contexts containing local pottery and silos for grain storage were identified. The important botanical samples containing seeds of the 11th century are being studied by Ed Treasure. This is the first medieval archaeobotanical study to be conducted in the area. Pluskowski, A, Boas, A J & Gerrard, C M (2011). The Ecology of Crusading: Investigating the Environmental Impact of Holy War and Colonisation at the Frontiers of Medieval Europe. Medieval Archaeology 55: 192-225.